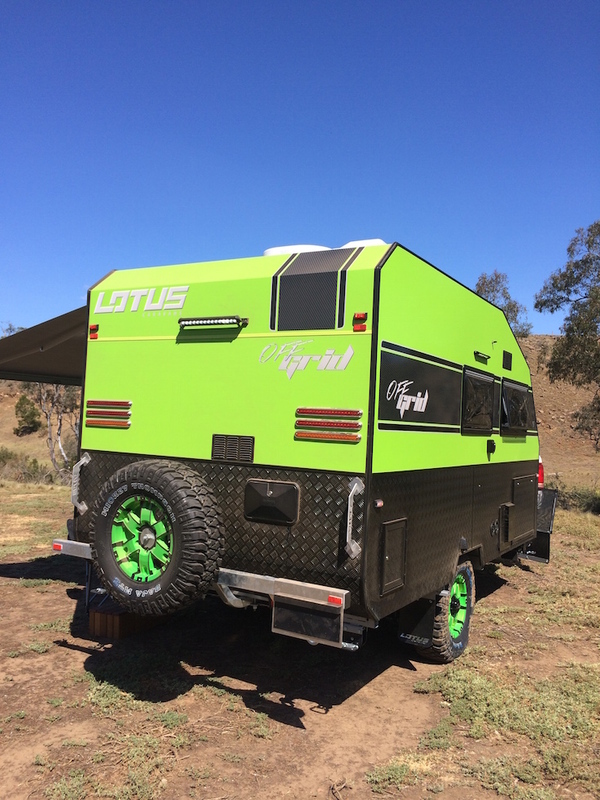 Short on length but not on features, the all new Lotus Caravans Off Grid is the latest steed out of the luxury caravan maker’s stable, and it’s designed for those who want the comforts of a van off-road, but aren’t too keen on towing something too big for their vehicle. Measuring in at 13.5ft and tipping the scales at just under 1800kg with a ball weight of just 140kg, the single-axle Off Grid offers a lot of comfort and features for its size. It has the same (albeit shortened) galvanised chassis from G&S Chassis’ that its bigger brothers do, and floats over corrugations on the latest Series Two Control Rider twin-shock independent coil suspension. The frame is made from timber to help with flexibility over harsh terrain and there are even recovery points on the rear of the chassis should you bite off more than you can chew in the sticky stuff. Step up inside however and it’s wall-to-wall luxury. Leather upholstery, inner-spring mattress and graphite and silver finishes give off a classy appearance that’s nicer than some apartments we’ve lived in. There’s even a toilet and shower on board. Given our climate, Lotus Caravans has mounted the 80L Waeco fridge and stove externally so you can enjoy the great outdoors while you cook up a storm under the massive Thule Omni awning. If you like your tunes there are a pair of external speakers, or if the weather turns nasty there’s no shortage of entertainment options inside, with a 24in TV to enjoy the latest episode of Game Of Thrones on while you warm up your popcorn in the 25L microwave. LED lighting features inside and out and the Sparrow air conditioning unit keep the interior at the right temperature no matter how deep in the tropics you are. With plenty of other features to ensure you can get away for a couple of weeks (or months) without the hassle and fuel bills associated with larger vans, the Lotus Caravans Off Grid could be just thing thing you’re looking for. Yes it is a pity the site is not up to date. All I want is THE PRICE!! I need to know if I can think about this one or go elsewhere. 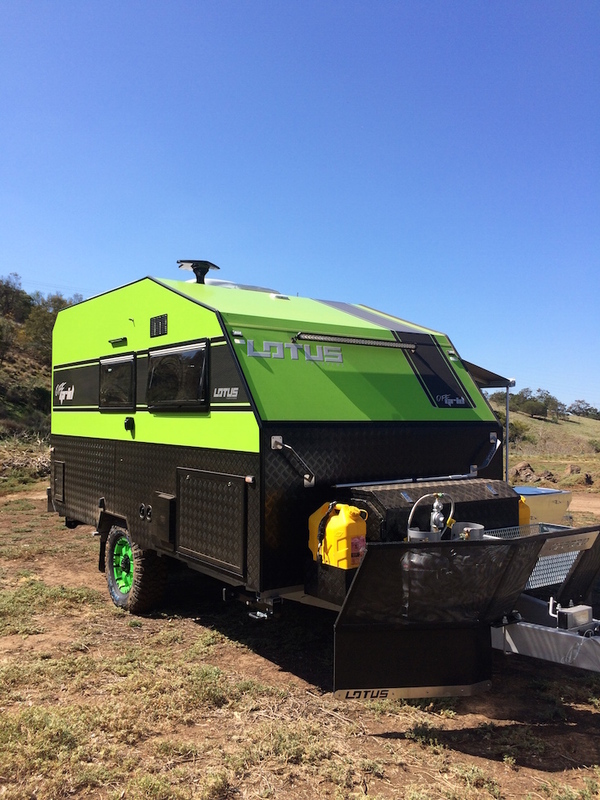 Hi Joan, Lotus have updated their site, you can find more details and images on the Off-Grid here http://www.lotuscaravans.com.au/caravans/off-grid. At the bottom of the page they have options on how to receive a quote/get a price, hope this helps! How do they power the Microwave, Fridge, Air conditioner and the 24″tv when off grid? No mention of the battery bank or solar panels? I agree with the others, no pictures of the inside? Timber frame? How about joining the 21st century and using aluminium and high bond strength adhesives. If you want to go hi tech start with resin infused composite moulded in one piece. 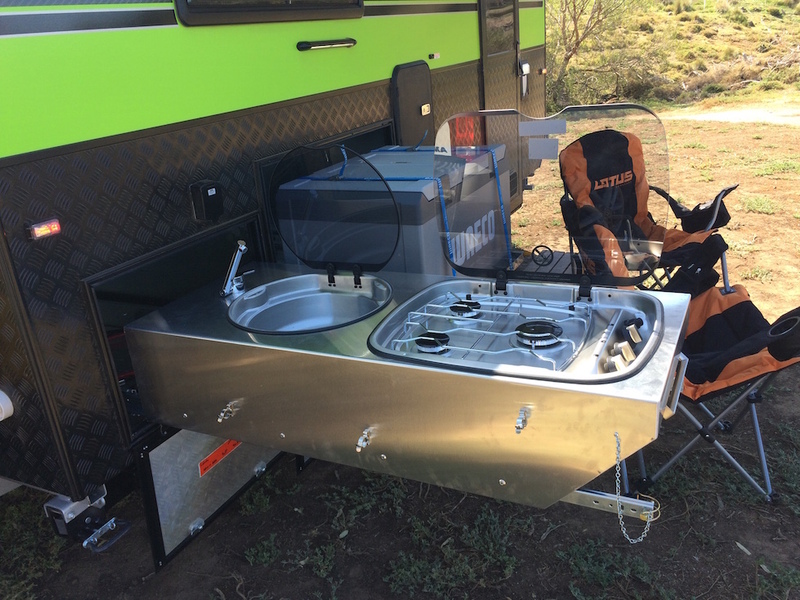 The outside cooking area is not as well thought of as on the Complete Campsite or now also the AOR range. Who cares about stereo or air conditioning when “off grid”? I understand this may be a prototype van. Pricing over $70k hence over priced as cmpared to several others in this region. Looks really Cool and will suit a lot who need something compact.